Xmas Joker from Play'n GO is a classic Christmas slot game with a simple design and a few features. The symbols feature Christmas-related items, such as gingerbread men, bows, bells, stars and gifts. The well-known Joker even wears a Christmas-themed hat. The special features include free spins that can re-trigger and a special bonus gift. The variance of the game is medium, which means that you won't win in every round but you should regularly win smaller and medium-sized amounts of money. The free spins trigger regularly, and can also re-trigger, and it is not rare to get a lot more than just 10 free spins. The theoretical return to player is 96.98%, which is on the higher end of slots payouts. You can also play Xmas Joker mobile on the go and enjoy the festive atmosphere of the game where ever you are. 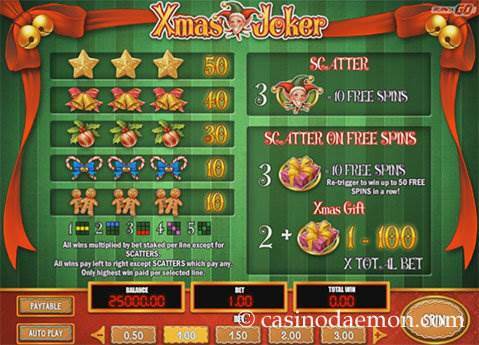 You can play Xmas Joker for free here and if you like this festive slot you can play it for real money in the online casinos listed on this page. The free spins trigger when you get three Joker scatters on the screen. 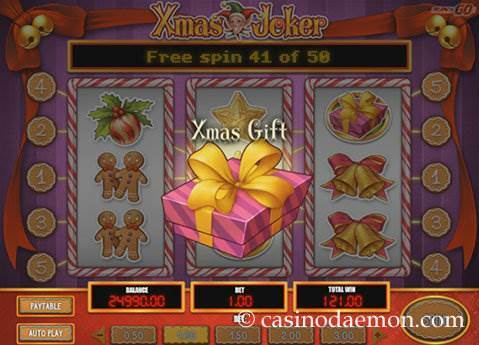 You will then get 10 free spins during which you can get the special Christmas gift symbol. This symbol is the scatter during the free spins and when you get 3 of them the free spins will be extended by another 10 free spins. You can get a total of 50 free spins. When you get two of these gift symbols on the screen you can also unwrap a Christmas gift which is between 1 and 100 times your total bet. 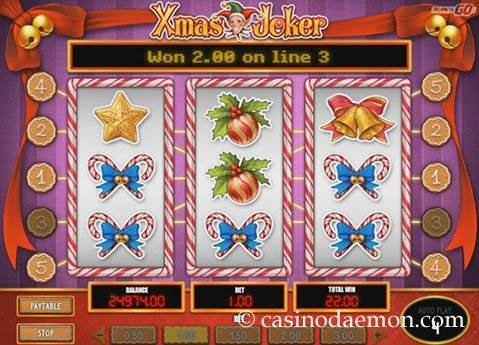 Xmas Joker is a classic slot with 3 reels and 5 fixed pay-lines. The slot can be played with a minimum stake of 0.50 €/£/$ and a maximum of 25 €/£/$ per spin. You can also select automatic play options.